Protractors are mathematical drawing instruments used to draw and to measure angles. Americans typically encounter them in elementary or middle school, when they are learning to produce reasonably accurate geometrical figures in order to explore mathematical relationships between those figures. Perhaps many people then never have reason to consider these objects again. However, protractors are not merely tools for enhancing learning but rather have a lengthy history of application in a variety of fields. The protractors in the mathematics collections of the National Museum of American History (NMAH) illustrate stories of technical work and innovation in navigation, surveying, engineering, and war. The protractor is over 500 years old. Although there were earlier instruments that were used for angle measurement in addition to other mathematical tasks, Thomas Blundeville described a tool specifically for drawing and measuring angles in his 1589 Briefe Description of Universal Mappes & Cardes. As the title indicates, he used the protractor in the preparation of maps, particularly navigational charts for use at high latitudes. It is not clear that Blundeville invented the protractor, for other European mathematical practitioners wrote about similar objects around the same time period. Regardless of who was first to describe the instrument, protractors entered the standard practices of navigators at sea and surveyors on land by the early 17th century. By the 18th century, the makers of mathematical instruments were explaining the manufacturing process for protractors, while the objects were beginning to appear in surveying textbooks and in introductions to geometry. 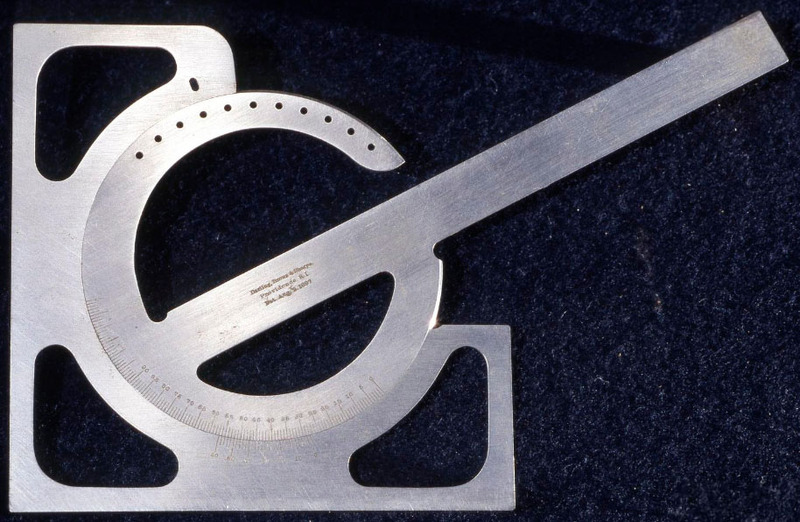 By the 19th century, machinists were devising a variety of specialized forms of protractors. 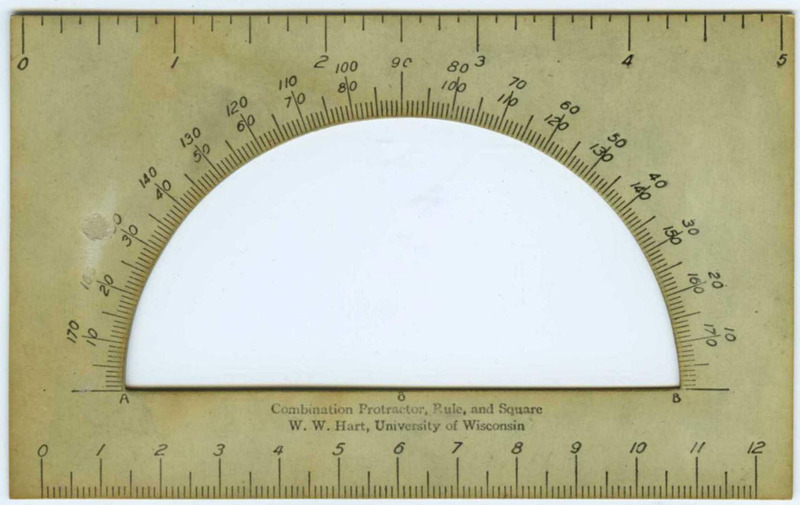 By the 20th century, protractors had become commonplace in school mathematics. In part because of these different uses, protractors have been manufactured in many shapes: the familiar semicircle as well as circles, rectangles, squares, quarter-circles (or quadrants), and sixth-circles. 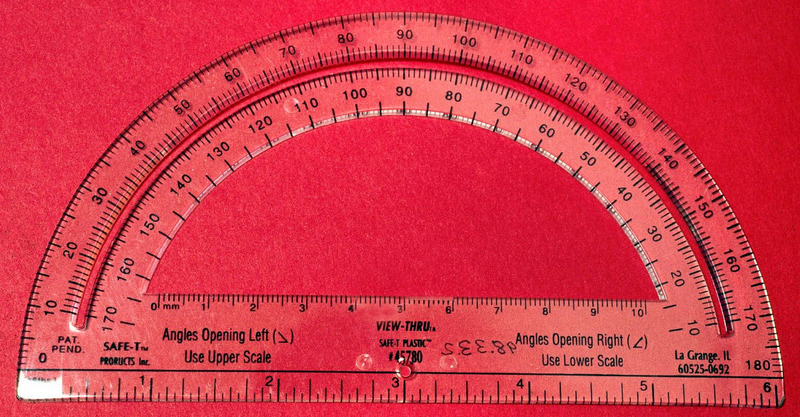 Protractors may have diameters as small as two inches or in excess of twelve inches. They may be made of brass, steel, wood, ivory, or plastic. As you will see by browsing through the images on the following pages, this diversity of shapes, sizes, and materials is reflected in the NMAH mathematics collections. These five-dozen examples also represent dates from about 1700 to 2000. They were made in Italy, France, England, the United States, Switzerland, Germany, and Japan. Although there are not many academic books and articles specifically devoted to the protractor, the page of resources offers suggestions for further learning about the general history of drawing instruments.